About 18 months ago BBC4 had a series of programmes under the title Reader I married Him and the point of this programme was to correct the slightly condescending view on Romantic Fiction which seems to be held by the literati. I said at the time and have managed to pull up my post on this here that they did not succeed as the general air of smug contempt permeated the entire programme and reinforced this view, rather than correct it. On Saturday I noticed they were repeating it so switched on to see if my perception of my earlier viewing still held. Well, it did and in spades and after fifteen minutes of the condescending approach turned the TV off. I am nailing my colours to the mast here and saying out loud and proud that I Love Romantic Fiction and I have done all my life. When I worked in the library system as a teenager and then an adult I had access to a huge variety of books and devoured them all and, while there are some pretty dire romantic writers around (as there are dire crime, adventure et al writers), we must not forget that Pride and Prejudice and Jane Eyre and Wuthering Heights and Tenant of Wildfell Hall and other 'classic' books all have love at their centre, with Pride and Prejudice in particular held up as the First Great Romantic Novel. The reason for this preamble/waffle is to tell you all that I spent a delightful time in bed on Sunday morning reading Fair Deception. 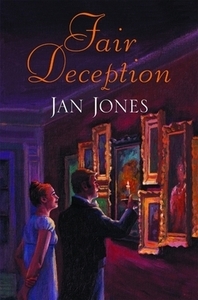 a Regency romance by Jan Jones. The clocks had gone back the night before but it made no difference to my inner clock and I awoke at the crack of dawn, very irritating, so decided to make the best of being awake at such a ludicrously early hour, therefore, back to bed after making a cup of tea, light on and started to read. Susanna Fair is an actress, hotly pursued by Lord Warwick, a nasty piece of work, who is not used to having his advances spurned and he attempts to abduct her when she is rescued by one Kit Kydd who had jut been watching her perform that evening, and to whom she was immediately attracted. It seems that Kit needs to appear settled in a good marriage to be made heir to his great aunt's fortune and as Susanna needs to disappear for a while to avoid Lord Warwick who is in the mood for revenge, she agrees to pretend to be his fiance for the duration of the visit to his aunt. "Strong arms were instantly around her, taking the weight off her crippled foot with a gentleness that almost made her weep....she received a confused impression of dancing blue eyes and gleaming hair that feathered her face as her rescuer bent to hoist her up. 'Truly a maiden in distress' he said, a laugh in his voice to match the irrepressible devilry in his gaze"
I will admit to an interest here and say that Jan is now a friend of mine and sent me a preview copy so you may think I am biased and of course I am. But, she knows that I would not say I loved the book when I did not and I think she writes with great style. 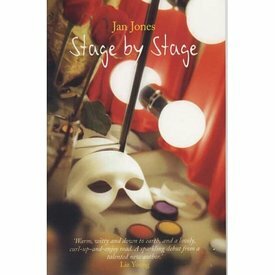 I read Jan's previous book Stage by Stage a couple of years ago and liked her writing immediately. (I would like to place a link here to my review but the Search engine on Random has gone down the spout - again - and I am waiting for it to be sorted). This book was published by Transita, a publishing house whose remit was to publish books for and by the over-40's woman, but it seems to have ceased producing such books and not sure where it is going at the moment. A shame but the enterprising authors who are no longer represented by them just went off and got themselves another publisher, not an easy thing to do, so I am simply thrilled to have a copy of Fair Deception in my hand hot off the press.